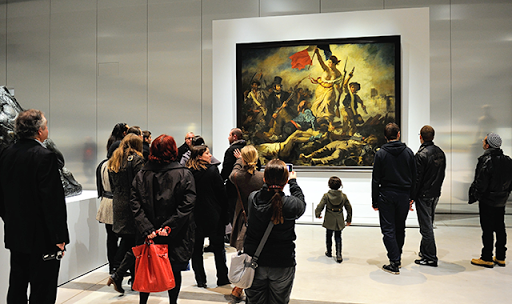 Eugene Delacroix’s masterwork, “Liberty Leading the People” (1830), was defaced on February 7th at the Le Louvre Lens, a satellite museum of the Louvre located in Northern France. According to reports, a 28-year-old woman used a permanent marker to write “AE911” in the lower right hand side of the painting. Both The Guardian and the Agence France-Press speculate the message refers to the organization Architects and Engineers for 9/11 Truth, a group calling for an independent investigation into the 9/11 attacks. The painting may have been targeted because of its revolutionary iconography. The graffiti, measuring only 30 centimeters, was removed the next day. The restoration took two hours and the painting remained hanging on the wall. The case resembles the vandalism of Mark Rothko’s “Black on Maroon” at the Tate Modern in October 2012. Vladimir Umanets, who was sentenced to two years in prison this December, defaced the painting to promote his radical art movement. For our report visit: Rothko Defaced at the Tate Modern. Sources: Kim Willsher, “Delacroix Painting at Lens Louvre Gallery Defaced with Permanent Marker,” The Guardian, February 8, 2013; Kate Diemling, “Vandalism of ‘Liberty Leading the People’ May be Linked 9/11 Truth Movement,” Artinfo, February 8, 2013. Image source: Agence Frence-Press.